Few dogs are as recognisable as the Dachshund, alternatively named the ‘sausage dog’ on account of its short, elongated body. Although its place of origin is generally accepted to be Germany during the 1600s, the Dachshund appears on many Ancient Egyptian relics and engravings, suggesting dogs of this kind actually existed much earlier in history. How the Dachshund developed remains a mystery for the most part, although some theories suggest it was the result of a mutation in the breeding of larger dogs like the Bloodhound – known as the Schweisshund in its native Germany. The mutation obviously wasn’t looked upon sourly however, as the dog was selectively bred to retain its distinctive short legs and long spine. Dachshunds were then used as pack dogs for scent hunting wild boar and badgers, skilfully manoeuvring into dens and forcing out the quarry for the hunter to shoot. This early usage gave the dog its name as ‘Dachshund’ translates to ‘badger dog’ – an apt title considering its role. The development of the Dachshund gained pace in the 18th century as German foresters desired a dog that could fit into rabbit warrens much smaller than badger dens, so efforts to reduce its body size were undertaken. This all-new ‘lap dog’ was quickly adopted by the royal courts of Europe who greatly admired its compact appearance and easy-going manner. Queen Victoria was one monarch of many who fell in love with the breed and embraced it into her royal household. From here, the Dachshund soon became a popular companion dog and later, show competitor, with many people being completely enamoured by the dog’s unique look. 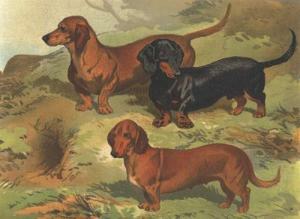 The first Dachshund show took place in England in 1859. Two decades earlier, the Dachshund is believed to have made its first appearance in the UK after being gifted to the Prince Consort from Prince Edward of Saxe-Weimar. The Prince Consort was so taken by these dogs; he kept them at Windsor and used them for hunting. Possessing three variant coat types, the Dachshund of today is characterised as wire-haired, smooth-haired or long-haired and is either standard-sized or miniature. It generally comes in colour variations of black and tan, blue, rust, wheaten and tan, with potential colour dappling of the coat. Ever since its first appearance, whether it was the result of an accidental mutation or not, the Dachshund has enjoyed a modest following. However, due to strong anti-German feeling during the Second World War, its popularity suffered serious decline. In time, breed numbers improved again and today the Dachshund is ranked in the top 20 most popular dog breeds in the UK, according to Kennel Club registrations. - The dog that was originally going to appear in the Wizard of Oz was a Dachshund named 'Otto' but this had to be changed because of anti-German sentiment during WWII. The dog was replaced with Toto, a Cairn Terrier. - The Dachshund was the official mascot for the 1972 Olympics in Munich, which isn't surprising when you bear in mind it is a German dog. I currently have a long hair red Standard, Desmond, and a lonh hair miniature Pebbles who is a black & Tan silver dapple. Desmond is 8 and Pebbles 12, both are rescues, I had Desmond 3 years and Pebbles 20 months. They are numbers 9 & 10 of Dachshunds owned since 1976, all have been long hairs and only my first, Misty, who was the runt of the litter, was bought, she was a real character. Fantastic Breed and great compaions.